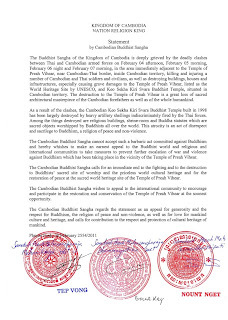 The Cambodian Buddhist Sangha with H.H. 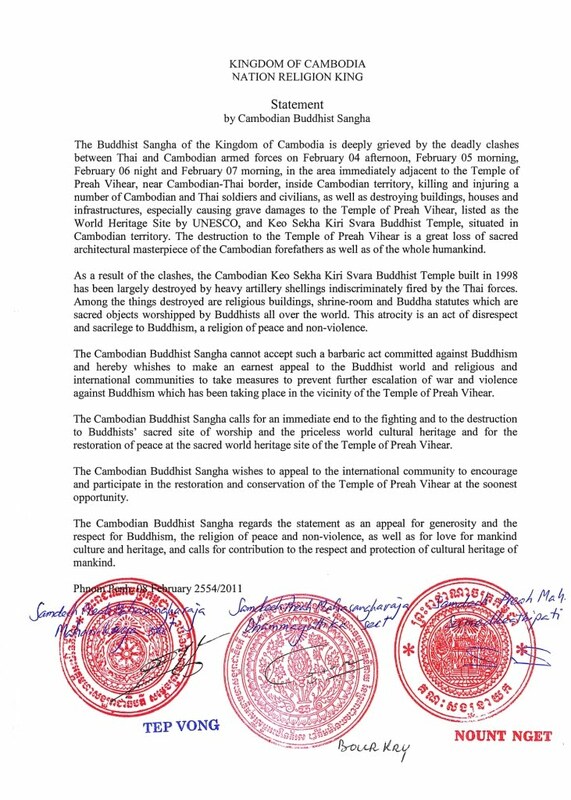 Tep Vong, a co-President of WCRP, as its Great Supreme Patriarch, wishes to humbly ask for your assistance to kindly spread as widely as possible the Statement of the Cambodian Buddhist Sangha with regard to the fighting between Thai-Cambodian armed forces, and the damages and destruction of the Temple of Preah Vihear and the Cambodian Keo Kiri Svara Buddhist Temple by artillery shellings indiscriminately fired by the Thai armed forces. The Statement is attached herewith. I heartily thank you for your kind and prompt assistance in this extremely urgent matter.